Each of our departments and initiatives works to meet the demand of a growing, diverse and passionate community. In coordination and partnership with many other institutions and individuals, our departments each help strengthen the quality of Jewish life locally and internationally through education, engagement, philanthropic, volunteer and professional leadership. The Ontario Jewish Archives, Blankenstein Family Heritage Centre, (OJA) is responsible for acquiring, preserving and making available the documentary heritage of Ontario's Jewish communities. Established in 1973, the OJA holds over 5,500 feet of original records and over 50,000 photographs related to the history of Ontario's Jewish communities dating from the 1830s to the present and from London to Thunder Bay. The OJA assists hundreds of researchers per year including genealogists, scholars, students, film makers, community agencies and UJA Federation staff. Our community programs, historical exhibits and walking tours help to inform thousands of participants every year of the rich and varied legacies left by those who came before us and those who continue their involvement with the community today. The history of the Jewish presence in Ontario begins at the OJA. Visit OntarioJewishArchives.org for more info. UJA Federation's investment in Jewish education is without parallel in North America where we have worked to develop the most comprehensive educational network comprised of Jewish day and supplementary schools. 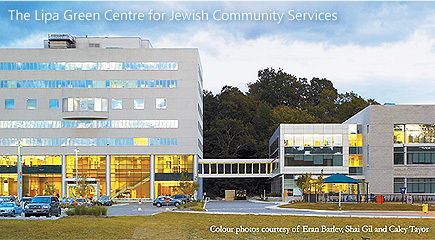 The Julia and Henry Koschitzky Centre for Jewish Education (CJE) is UJA Federation's educational department, dedicated to strengthening, enriching and promoting the quality of Jewish education in the Greater Toronto Area. The CJE currently serves formal education by providing services and support to over 50 day and supplementary schools, 1,700 educators and 15,900 students. The Tuition Subsidy Programs and the support for special needs are included as part of this role. Visit CJEToronto.com for more info. "My kids are so excited when I pull out that blue and white envelope from the mail box. They exclaim "PJ Library!" and rip it open as fast as they can. From the parent point of view, it is so important to have books at home that mirror what we value and the kinds of activities we want to participate in. They can read a book about a world of talking trains, but we are not talking trains - we are Jewish." PJ Library is working like no other program to successfully engage young families raising Jewish children in Toronto, Peel and York Regions. Over 4500 families with children 6 months to 5½ years old have benefited from the international, award-winning outreach program receiving Jewish themed books and music into their homes each month. Over 7,000 children, parents and grandparents have also enjoyed attending PJ Library programs as PJ Library continues to influence families to make Jewish connections in the community, foster Jewish education choices and guide families to Jewish camps, organizations and causes. Your support will allow us to continue reaching out to even more families through PJ Library. Visit PJLibraryToronto.com for more info and to register your child. UJA Federation invests 1.5 million annually in arts, culture, and heritage programs that serve audiences of over 260,000 a year and hundreds of thousands more globally via web and social networks. The lead funded agency of the UJA is the Koffler Centre of the Arts. Visit KofflerArts.org for more info. Each year thousands come together to exercise, learn and socialize at one of the three JCCs across the GTA. Whether it's downtown at the Miles Nadal JCC, mid-town at the Prosserman JCC, or north at the Schwartz/Reisman Centre, our community thrives on the programming offered by these agencies to enrich the Jewish lives they want to live. Downtown: visit MNJCC.org for more info. Uptown: visit ProssermanJCC.com for more info. Vaughan: visit SRCentre.ca for more info. The Sarah and Chaim Neuberger Holocaust Education Centre is dedicated to preserving the past while educating future generations. Through education and remembrance we safeguard the lessons of the Holocaust in order to nurture an inclusive society. Each year the Neuberger Holocaust Education Centre engages over 70,000 students, educators and community members through a vast array of dynamic professional programs, events and services. Visit HolocaustCentre.com for more info.